Ghost is an ambitious hard rock band from the suburbs of Oslo, Norway. 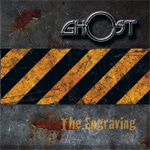 Formed in 2002, Ghost has released one demo and EP, and now in 2010 their first full length album, The Engraving. Ghost makes no apologies to their rock roots or agenda. They are firmly rooted in the melodic hard rock and metal that made the 1980's famous. A single spin of The Engraving proves that this crew knows their history and genre. This is solid and hearty European-flavored melodic hard rock with a definite metal edge. Invoking a metaphor that has been used elsewhere, Ghost will haunt you until they persuade you of their talent. The musicianship is firm and the production surprisingly crisp on The Engraving. Vocalist Kim Sandvik has a strong vocal range and presence with a raspy rugged nature equally fitting hard rock or metal. This is quite apparent throughout but especially on Independence Day. The rhythm section is steady and persuasive, and the twin lead guitar work is sound and quite often soaring. Generally, the songs lean to the heavy side, yet are blessed with significant melody and infectious hooks. The Engraving, Surgery, Taking Lives, One Last Favor, and Here I am are rip-roaring pieces of ambitious melodic hard rock. Surely, eight years of hard work brought Ghost to create The Engraving, and the result is a impressive and entertaining debut. Melodic hard rock fans should dig this work. Very recommended! Surely, eight years of hard work brought Ghost to create The Engraving, and the result is a impressive and entertaining debut. Melodic hard rock fans should dig this work.